Do enjoy visiting exotic locations? Meeting new people? Shooting them? If so, you might be a prime candidate for membership in the Galactic Space Marines. Just make sure to save up some cash before going to the recruitment office. The Space Marines don't want slackers, and if you can't even afford to equip yourself, you don't have what it takes. If all your gear meets the Uniform Military Code and you're accepted into the Corps, you can look forward to adventure, excitement, and (if you live long enough) maybe even Citizenship. Plus, you can earn big bucks (or at least enough to pay for the latest required equipment upgrade). Self-Made Space Marine uses the QAGS Second Edition System and the Qik Start Rules are included in the PDF. The game was written in an attempt to claim a $500 bounty that never materialized. 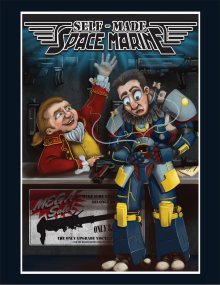 A print edition of Self-Made Space Marine is now available.